Plywood is a composite material created from wood. These are sheets formed by gluing together several thin layers of wood - veneer. Fibers of adjacent layers are arranged at an angle to each other, as a rule, perpendicularly. Due to this, the high strength characteristics of plywood and its stability during moisture fluctuations are combined with large sheet sizes, which is practically unattainable for solid wood. First, the logs selected for production are soaked in warm water to provide wood softness required for processing. From prepared churak of a certain size, veneer is obtained, which is then leveled and dried. The veneer is sorted, defects are eliminated in it, and sheets of a certain size are formed from it. Veneer sheets are assembled in a specific order and bonded to each other with glue. 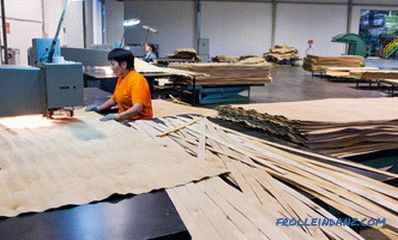 After drying the received bags, their edges are cut to the required format, and the front surfaces are sanded and coated with a decorative layer if necessary. Different methods are used to obtain veneer. 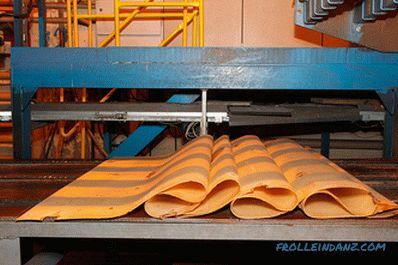 Circular peeling is most often used: the prepared block rotates around the longitudinal axis, and a special knife removes a thin layer from it. The removed layer of wood is unrolled into a ribbon, cut into sheets and sent for further processing. In some cases, peeling with eccentric rotation of the workpiece is used. This gives a more interesting periodic pattern due to the intersection of annual layers with a knife. Less often, flat planing is used, which allows to obtain veneer with a given pattern of pattern, depending on the direction of processing. There are tangential and radial veneer. They differ in the location of the working plane with respect to the radius of the log and the type of pattern that forms the tree structure. 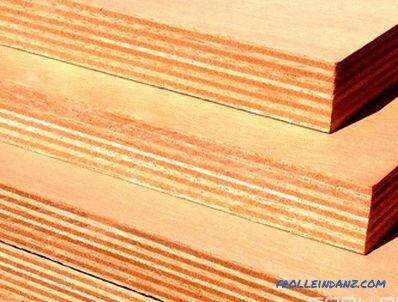 For the production of veneer this method selects quality wood that does not have defects. For special cases, the veneer is produced by cutting. 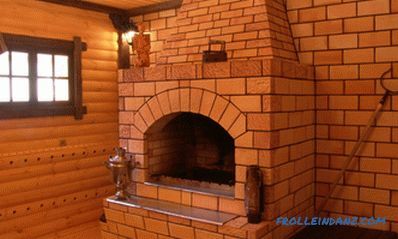 This method does not require special preparation of wood and allows you to get a natural pattern with a natural color. The resulting veneer contains various defects inherited from wood. In addition, there may be damage caused by the production process itself. In addition, the primary material does not always correspond to the required format of sheets. To bring the veneer to the desired parameters, it is further processed. First of all, material is selected and rejected. Removed unsuitable sheets or parts thereof, loosely bound or affected by rot and selected suitable for further steps. Cut rotten, loose and poor-quality areas. Then the individual parts are cut at the edges and glued into sheets of the desired size. If necessary, knots are removed and patches are inserted in their place. Spread cracks are repaired in the same way. Adhesive packages are formed from the prepared and dried veneer sheets. Usually they include an odd number of layers. The central layer is laid structure in the transverse direction, each following - at a right angle to the previous one. The direction of the outer layers on both sides is the same and is considered longitudinal. There is plywood and with an even number of layers. In this case, the two central layers have the same direction of the structure. All layers, as a rule, have the same thickness. But in GOST, the requirement is specifically stated that the layers are located symmetrically relative to the central one. Veneer gluing is done with a press and high temperature. The press provides uniformity and minimum thickness of the adhesive layers, and heating is necessary for curing the resin. After gluing, sheets are kept in bags for even cooling and leveling of internal stresses and humidity. Glued plates are cut at the edges on special machines. This operation gives even ends and provides the exact format of sheets. the quality of the face layers and the use of special coatings. By type of wood, plywood is divided into hardwood and softwood. There are even two separate standards for them: GOST-3916. 1-96 and GOST-3916. 2-96. Plywood can be made of both types of veneer and their combination. Its appearance is determined by the appearance of the wood of the outer layers. There are several brands of plywood that differ in their properties. 1. PSF - plywood glued with phenol-formaldehyde resin. Durable and fairly resistant to moisture. Most often used in construction. 2. FC - the veneer layers are glued with carbamide glue. The material has a moisture resistance slightly lower than that of PSF. As a rule, by production ecological safety is easier provided. It is used for the production of furniture, containers, for interior decoration, structures used in dry rooms. 3. 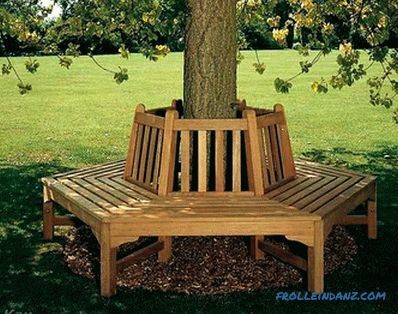 FB is a family of bakelised plywood with different types of bonding and impregnation of veneer with bakelite resins. The use of bakelite resin gives the plates a surface hardness, increases the flexural strength by 2-4 times, increases moisture resistance by 50-70%. Particularly high strength and moisture resistance is possessed by FBS plywood, which is completely manufactured using alcohol soluble bakelite resin. It even withstands contact with sea water. It is used to make payoli, banks and transom for inflatable boats, details of the hull set of small ships. The brand of the FBV differs in that a water-soluble resin is used for bonding. Because of this, FBV is about 16% less water resistant than FBS. In addition to these two, there are additional brands, with various combinations of alcohol-soluble and water-soluble resins: FBS-1, FBV-1, FBS-1A. 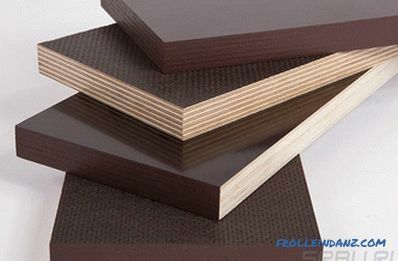 For bakelized plywood of the FBS and FBV types, the outer layer uses veneer not lower than grade II, for plywood with a combination of resins of different types (FBS-1, FBW-1, FBS-1A), veneer is not lower than grade III. Detailed specifications are described in GOST 11539-2014. 4. The FBA is the only brand of all-natural plywood. In it the veneer is glued with albumin or casein glue. This material is completely environmentally friendly, but not water resistant. The grade of plywood is determined by the quality of its surface. Wood is a heterogeneous material in which knots, caverns, cracks, and rot can occur. When peeling, these defects become veneer. About their removal was mentioned above in the section on production. A comprehensive list of all permissible defects is defined in the GOSTs: both natural for wood and specific production flaws. It provides for the admissibility of defects of each type for each type of material, their maximum dimensions and quantity per sheet or per unit area. For hardwood and softwood, the requirements are somewhat different, so softwood varieties have the index “x” in their designation. Below, in a somewhat simplified form, the permissible defects for hardwood and softwood are listed. 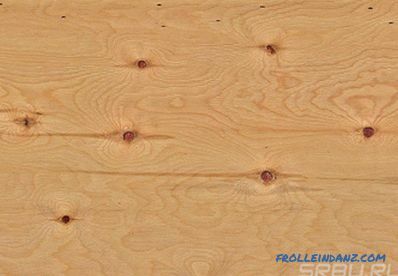 No visible defects are allowed on the surface of sheets of grade E.
On softwood plywood of Ex variety, there can be pin knots in the amount of up to 3 pieces per 1 m 2 . For deciduous, single minor changes in the structure of wood are permissible. repair inserts for embedding knots. adhesive tape or glue penetration. 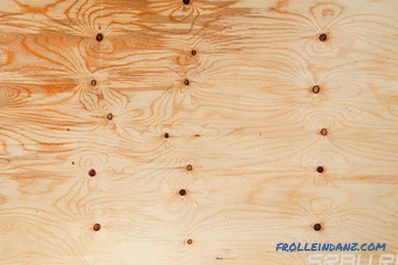 The surface of plywood of Grade 3 can contain all types of defects listed for Grade 2. The difference in their number and size. We list some of them. The permissible length of overlaps for conifers has been increased from 200 to 400 mm, and their number from 3 to 5 pieces. There are similar changes for hardwood. The length of cracks is increased from 300-400 mm to 600, and their width from 2 to 5 mm, and for grade 3x to 10. For conifers, the limitation on the number of knots has been removed and their size has been increased to 70 mm, and for hardwood, knots with cracks are allowed. For plywood, 4 grades most restrictions were lifted. Only the maximum dimensions of extensive defects, such as knots (up to 100 mm), split cracks (up to 15 mm), width of edge defects (up to 15 mm), and others are regulated. This grade is a technical material, the outer layers of which are subject to minimum requirements so that it preserves the required mechanical qualities. For each grade of plywood, there is a requirement for the number of types of defects that are simultaneously present on the sheet. For example, if besides knots there are still cracks, overlaps and sprouts, then the variety of such material cannot be higher than 2 or 1x. For grade 4, any defects are allowed in any quantity, with the exception of rot, but with limitation of their size in accordance with table No. 3 of the GOST. The quality of two different sheet surfaces may not match. In this case, the variety is indicated for each of them, through a slash. For example, grade 1/2 plywood, grade 2/2, grade 2/4, grade 4/4, and so on. Grinding makes the material smooth and makes it ready for finishing, which is convenient for finishing works or in the manufacture of furniture. Grinding is one or both sides of the sheet. 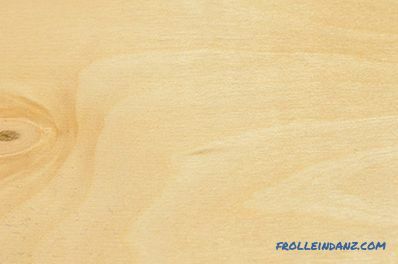 The surface of the plywood may be coated with a laminated paper-resin coating based on phenol-formaldehyde resin. This coating gives the surface hardness and wear resistance. 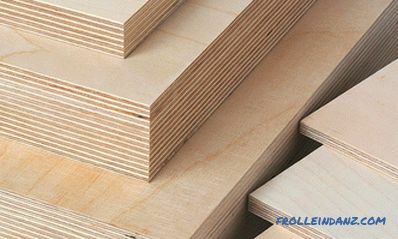 Laminated plywood is used in furniture production, for finishing works, as a material for creating various designs, for making reusable formwork. 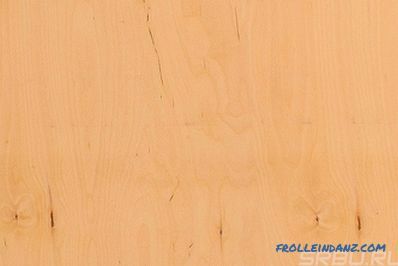 For example: "FSF pine plywood 2/4 Е1 Ш1 1525х1525х6.5 GOST 3916. 2-96" is the designation of pine PSF plywood with surfaces 2 and 4 grades, first class emission, with one-sided polishing, 6.5 mm thick with dimensions of 1525x1525 mm, made in accordance with GOST 3916. 2-96. For laminated plywood, the film brand is additionally indicated. Marking bakelised plywood is easier. It includes only the name, brand, size and reference to the standard. For example: "Plywood FBS 1500x1250x5 GOST 11539-2014". 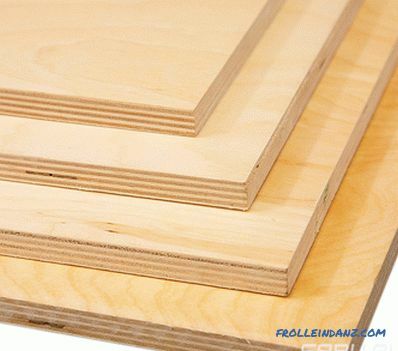 The strength of plywood depends on the characteristics of the original wood and the bonding strength. The strength is indirectly indicated by the density of the material. As a rule, the density of plywood varies between 550-750 kg / m 3 , that is, it roughly corresponds to the density of wood or slightly exceeds it due to the higher density of the resin with which the veneer is held together. Different density levels are provided for standard plywood - from 300 to 1000 kg. Low specific gravity is possible when using light wood and "loose" veneer. Weighting is due to the use of more dense resins and other features of the manufacture of a particular type of material. 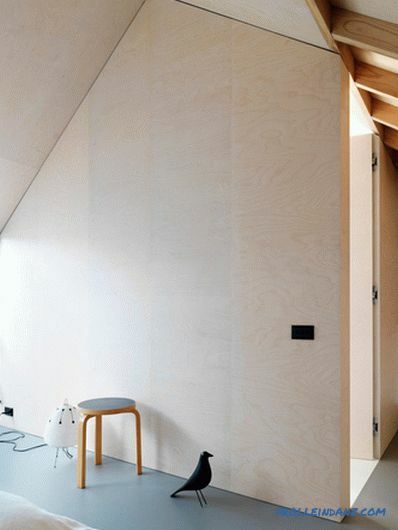 For example, bakelised plywood may have a density of up to 1200 kg / m 3 . She also has the greatest strength. The main, most important indicators of the strength of plywood - this is the ultimate strength in bending, the strength of retention fasteners. The strength of plywood brands FSF and FC for bending is about 3-4 times lower than that of solid wood. PBS and FBV grades are superior in strength to the original wood. The pulling resistance of screws is quite high due to the pronounced layered structure (when installed in the face) and reaches 6-8 kg for every millimeter of fastener length. Ecological properties of plywood are characterized by its emission class. The best brand in this respect is the FBA. There are no synthetic materials at all. 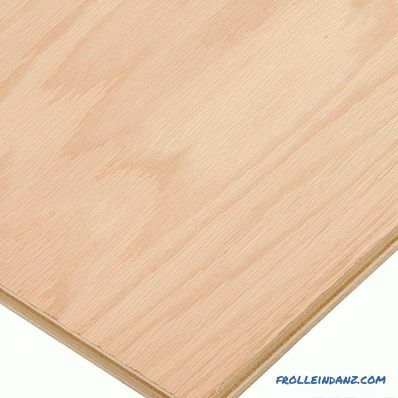 All other plywood brands are to varying degrees sources of volatile formaldehyde. For residential use, materials with emission class E1 and below should be selected. It is interesting that in GOST for laminated plywood only class E1 is provided. Plywood is not insured against damage by rotten, blue (for softwood), mold. However, the resistance of plywood to biological and damage is higher than that of ordinary wood. This is due to the fact that the veneer is in direct contact with phenolic or urea resins, which partially perform the functions of an antiseptic.Softwood veneer has a higher resistance due to the characteristics of wood. 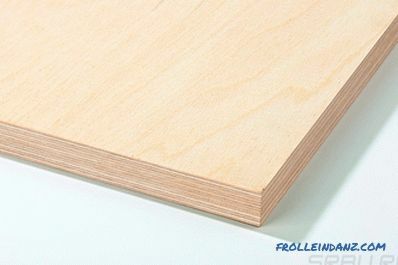 Bakelized plywood has the highest resistance. In any case, consider the conditions of use of the material and choose the appropriate one for them or carry out additional antiseptic processing. Plywood is a highly combustible material. This must be taken into account when applying it. It is possible to increase the fire resistance of structures and products from it by special treatment. There is also a special, difficult combustible grade of plywood - FSF-TV. The moisture resistance of the most popular varieties of PSF and FC demonstrates the test for the separation of the sheet, which is carried out after a strong wetting. Before testing, the FC plywood is soaked in water for 24 hours, the FSF brand is boiled for an hour, and by agreement with the customer - for 6 hours. PBS and VW brands are also boiled for an hour. FBS - 17.6 kg / cm 2 . The PBS brand is suitable for tropical climates and other difficult conditions. Plywood can be used as part of external enclosing structures. In this application, its insulating qualities are taken into account. Any plywood is capable of absorbing water, and therefore permeable to moisture. However, the moisture permeability of a material is capillary in nature and depends on the type of impregnation. In any case, when wetting one side, moisture will penetrate to the opposite side and can be transferred to adjacent layers of the building envelope. The thermal conductivity of plywood depends on its density and can vary from 0.09 to 0.25 W / (m ∙ K). For the most used brands, the thermal conductivity of the material is close to wood. Water vapor permeability is an important parameter that is taken into account when calculating multi-layer structures enclosing rooms with an artificial microclimate. The permeability of plywood is about three times lower than the permeability of wood in the direction across the fibers, and five times lower than the permeability of brickwork. This property in some cases can be used for vapor barrier walls from the inside, and be sure to consider when using plywood for exterior cladding. When using plywood, some of its features should be considered. Placing the flat parts in three mutually perpendicular planes, it is easy to achieve high strength of the product. The main thing is to correctly distribute the existing loads and ensure the reliability of fasteners. Nails are very difficult to enter into the sheet layer, and practically they do not hold at the end. 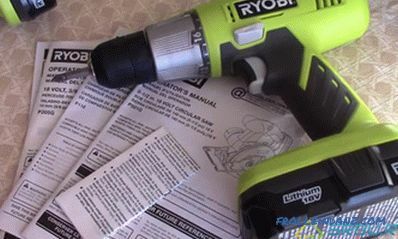 It is possible to use nails only as nogs - hammering into a pre-drilled hole. They are used under load "on the cut" and relatively weakly resist pulling. Screws and screws, screwed into the face, very well resist pulling. But almost always for their installation need prior drilling. When sawing plywood, one should take into account the ease with which surface chipping and veneer tears occur during this operation. To obtain a clean cut, you need to use small-teeth saws, high-speed sawing machines with a cutting cutter, and when working with a hand tool, leave a margin for finishing grinding. For grinding, you must use a belt grinder with the direction of movement of the belt along the edge. 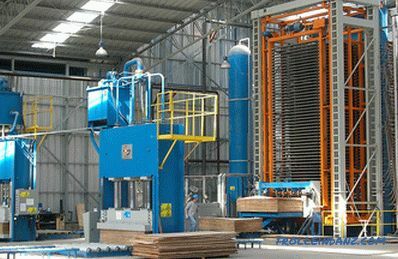 The main field of application of plywood is construction. 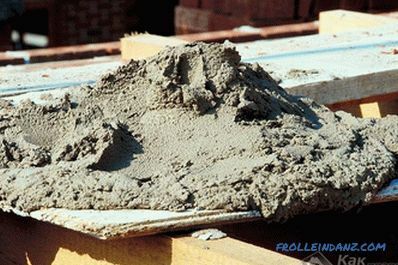 It is used for covering frame structures and cladding, as a basis for roofing or floor covering. Depending on the brand, this material is used in the manufacture of packaging and furniture, in shipbuilding and car building. Decking and load formwork for concrete works are made of it.